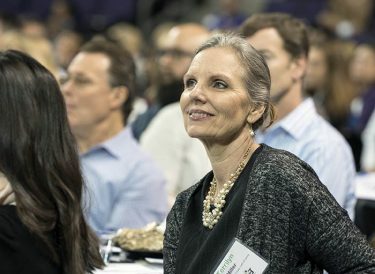 The now famous African proverb suggests, “It takes a village to raise a child.” That theme was evident Thursday at the School Connect 2017 Summit, which emphasized the power of collaboration to build strong, sustainable partnerships to support Arizona students. 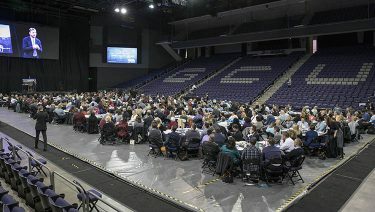 This is the third year School Connect, a Glendale-based nonprofit, has brought together district superintendents, business, faith, government and nonprofit community leaders to Grand Canyon University to identify common goals and aspirations and create community partnerships. School Connect originated with Palo Verde Middle School in Phoenix, which had been failing academically and had a negative reputation in the community. With a strategic plan in hand and community support, Palo Verde became devoted to eradicating poverty and bringing community together. 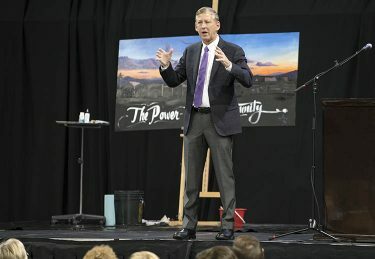 That echoed the theme of the keynote speaker Thursday, GCU President Brian Mueller. He discussed the value of community engagement and how mutually beneficial relationships impact the community. Mueller emphasized how, like many private institutions of higher education, Grand Canyon had endured its share of struggles since its humble beginnings in 1949. He talked about GCU’s unique opportunity for funding a private Christian university and its five-point plan to revitalize west Phoenix. “Businesses, churches and schools have always been the foundation of our country,” Mueller said. “If those three groups are willing to work together, they’re not leaving any poverty. The story of Grand Canyon University involves those three things. For one special guest — the theme of community hit close to home. 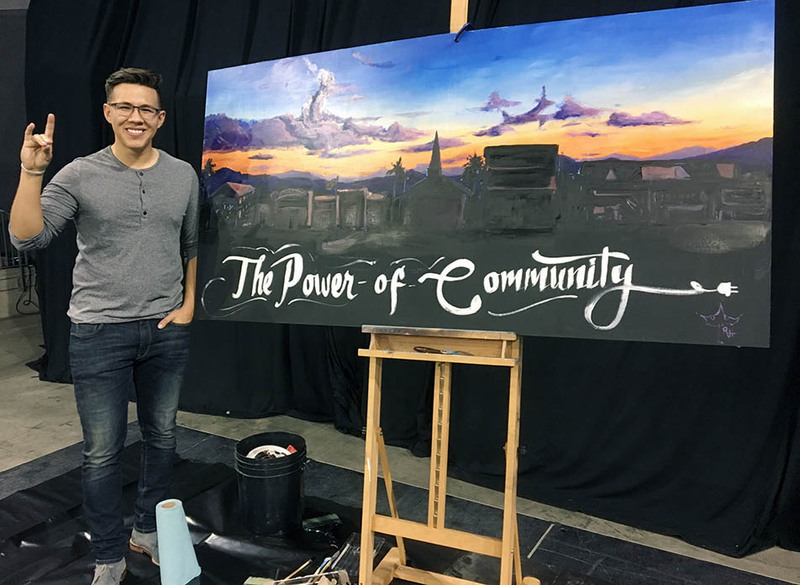 Ruben Hernandez, an A student, community leader and part-time muralist at GCU, tells his story — one that also deserves to be heard — through art. Hernandez, 23, a high school dropout, former west Phoenix gang member and graffiti artist, witnessed the effects of drugs, alcohol and the deaths of close friends before eventually receiving a misdemeanor for drugs. 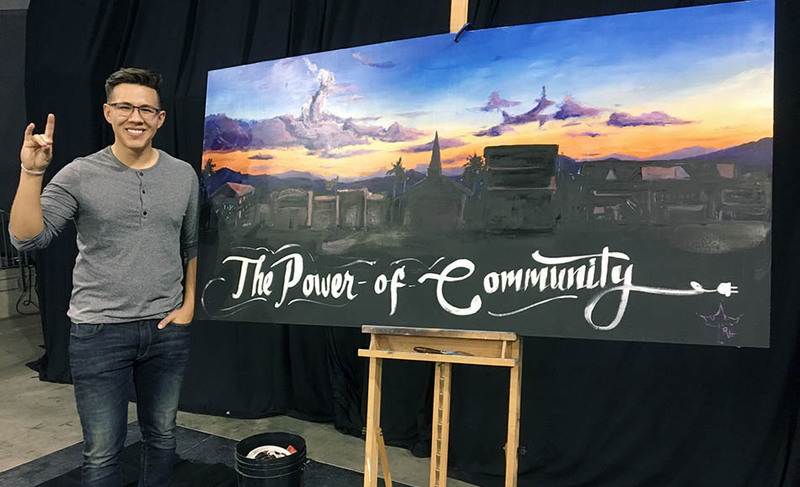 Through the course of the Summit, Hernandez stood at the center of GCU Arena, painting an acrylic canvas that would represent all of the distinctive places in his life, including the apartments he grew up in, his church and, lastly, GCU Arena. Days later, a family member invited Hernandez to attend church. To his surprise, it was the same church where he had done community service, and the man he thought was the janitor was the pastor. With the support of his mother, the pastor and teachers, Hernandez found the courage to change his life. Fast forward a couple of years: Hernandez had been working part-time at a preschool when a GCU faculty member went in for a tour. Hernandez knew he wanted to obtain a college degree, and it was then that he experienced God’s abundant blessing. As for his next step, Hernandez has an intense desire to open a local amphitheater to give children an opportunity to express themselves artistically. “I started here as a tagger, a vandal, and I would’ve never imagined that an immigrant kid would make it to college. It’s because of people like you,” Hernandez told the crowd.